Like all languages, Lithuanian has what linguists call a phonemic, a morphological and a syntactic structure. By the phonemic structure we mean approximately the sound system of the language. The great advantage that Lithuanian has over many languages of the world is that the sound structure is so well correlated with the alphabet. If one learns how the individual letters of the alphabet are pronounced, one does not have the trouble that one might have with English. English is, of course, unusually bad in this respect and George Bernard Shaw even suggested that the word fish might be spelled ghoti (i.e. gh as in enough, o as in women and ti as in nation). Such an outrage would never occur in Lithuanian. 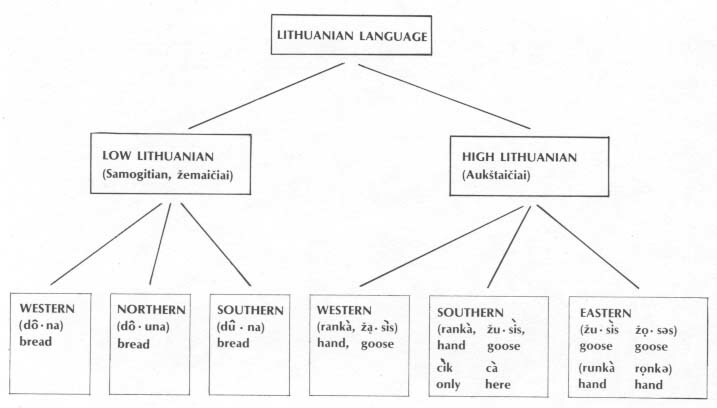 I refer the reader to the chart below reproduced from Dambriūnas, Klimas and Schmalstieg's Introduction to Modern Lithuanian (New York, 1972), pp. 18-19. * e and a are lengthened in most cases in open syllables: gãlas 'end,' medis 'tree' (but: màno 'my,' etc.). Notice how simple the vowel system is. There are really only six kinds of vowels, but they can all be either short or long, with the exception of ė (pronounced a bit like the a in date, but without any y off-glide at the end of the vowel, as in English.) If one wants to count the short and long vowels as two vowels then one would have to say that Lithuanian has eleven vowels rather than six. Let's leave this problem to the linguist. Although Lithuanian is much better than English with regard to the orthography, it still isn't perfect. For example, the long vowel /ī/ (pronounced a bit like the English ee in beet, but again without the characteristic English y off-glide) can be represented in two ways in Lithuanian, either by the letter y or į. This hook (nósinė) under the letter shows that originally the vowel was followed by an -n, then became a nasal vowel and finally the vowel was lengthened and the nasal pronunciation was lost completely. An easy way to remember this is by comparing the English word in with the Lithuanian word į which also means 'in.' (In fact some Lithuanians still say in.) Likewise the long vowel /ū/ (pronounced a bit like the oo in the word boot, but without the w off-glide characteristic of the English vowel) can be written either ū (with the macron, or long mark on top of it) or ų with the nasal hook under it. Since ę (like the a in bat, but long) and ą like the o in American English hot, but long) derive from original nasal vowels they are also always long vowels. But there is again a trick because e and a can denote either a long vowel like ę and ą. In English we don't have any phonemic contrast between long and short vowels, even though you might get this impression from looking at an English dictionary which shows macrons (or long marks) over some vowels. For example, you will probably find the word bite supposedly to be pronounced bīt, but this is just a way school teachers and dictionary writers have of denoting the English diphthong, which really should be written ai or aj or something like that. Therefore a speaker of English learning Lithuanian might have trouble making a distinction between the short and long vowels. An English speaker might not be able to hear or to reproduce the difference between the short vowel of sèkti 'to follow' and the long vowel of sẽka 'follows' (3rd person present tense). Now ordinarily, of course, the accent marks aren't written in Lithuanian so the words màno 'my' (with a short initial vowel) and mãno 'thinks' (with a long initial vowel) will both be written mano and the speaker of Lithuanian can only tell by context which word is meant when he runs across it in a written text. Of course, in speaking, the words will be clearly kept apart by the length of the vowel. As my colleague Professor A. Klimas has pointed out to me, one might make up a sentence such as: Jõ žmonà mãno vienaĩp 'his wife thinks one way;' màno mãno kitaĩp 'mine thinks otherwise.' But in an unaccented text the sentences would be written: Jo žmona mano vienaip. Mano mano kitaip. This brings up the next problem of Lithuanian, the problem of accent. A short accented syllable is marked by the grave accent à whereas a long accented syllable might be marked either by the circumflex as in ã or the acute as in ą. It used to be stated that the circumflex was a rising tone and the acute was a falling tone, but nowadays people talk more of the role of the stress accent. Thus an acute vowel (tvirtaprãdė priegaídė) is stressed more heavily on its initial part, whereas a circumflex vowel (tvirtagãlė priegaídė) is stressed more heavily on its second part. The difference can probably be seen best in the diphthongs. Compare the difference between áukštas 'high,' 'tall,' and aũkštas 'floor,' 'storey.' In the first word the a- is stressed and longer than the a- in the second word. The -u- in the second word is more heavily stressed and longer than the -u- in the first word. Professor A. Girdenis, the late Professor J. Kazlauskas and I all feel that the diphthongs are divisible into the individual vowels of which they consist. According to such analysis the diphthong au can be divided into its components a and u. Other analyses treat the diphthongs as indivisible entities. The matter is discussed very well by Klimas, 1970, 100-101, and I won't consider it further here. Although it is not indicated on the chart, most of the consonants have two variants, a palatalized (or soft) and an unpalatalized (or hard) variant. Looking at the chart under 'dental' we find the 's' in a word such as saũsas 'dry' (pronounced a bit like English souses but with an ss sound, not a z sound at the end of the word). Or it might be pronounced soft (or palatalized) in such a word as sèkti 'to follow.' It sounds almost as though one were to pronounce sack tea in English, but with a y sound after the s, as if we could say *syack tea. The English speaker will usually hear the soft or unpalatalized consonants as if there were a y following them, but this is just a trick that the English speaker's ears play on him. Actually the y sound is pronounced along with the consonant itself and doesn't follow it. It usually takes an English speaker a little bit of practice before he can master such sounds. People who have spoken Lithuanian since their childhood don't usually have any trouble but people who first heard Lithuanian spoken later in life don't pronounce it quite so well. All of the consonants in Lithuanian except the j which is pronounced like an English y already exist in two varieties, a hard (unpalatalized) and a soft (palatalized) one. I have already noted in chapter 1 that the morphological structure of the Lithuanian noun is quite complex, more similar to that of Latin, Greek and Sanskrit than to English and French. I mentioned in that chapter the nominative, genitive, dative, accusative and vocative cases, but said nothing about the Lithuanian instrumental and locative cases, cases which, as far as meaning is concerned, it shares with Sanskrit. Now it is well known that no two persons, natives of the same language, speak it in exactly the same way. There are always minor differences in pronunciation, use of vocabulary, choice of vocabulary, etc. For the most part persons who have something in common tend to speak the language more alike than persons who have less in common. The more these minor speech differences increase, the less people have in common. Thus we can establish dialects, most commonly on the basis of geographic distribution, but dialects according to social or economic class are also usually encountered. All of the contemporary European nations have chosen some dialect or group of dialects upon which the standard language is based. Americans are for the most part satisfied with a middle-western Chicago type pronunciation and deviations in pronunciation from this norm are considered dialectical. Of course, this standard is a dialect also, although many people don't realize it. For any given group of speakers of one dialect, the other dialect seems odd or anomalous. Australians talk about the American accent, whereas Americans talk about the Australian accent. The Samogitian (Low Lithuanian) dialects are called western, northern and southern respectively and the three dialects of High Lithuanian are called western, eastern and southern. A variety of the western dialect, the Kauniškiai is the basis of standard Lithuanian. (See Jonikas, 1972, 293-299 and Zinkevičius, 1978a, 25-28.) This dialect, although called Kauniškiai is different from that of the inhabitants of the city of Kaunas. One characteristic of this dialect which separates it from standard Lithuanian, however, is that the sequences -en- and -in- in infinitives and some other forms have passed to long vowels, rather than remaining as -en- and -in- respectively. For example, standard Lithuanian has gyvénti 'to live', gyvénsiu 'I shall live' but the Kauniškiai dialect has respectively gyvẽti, gyvẽsiu where the e is pronounced like the a in the English word class. It will be remembered that we classify the Samogitian (Low Lithuanian) dialects according to how the counterpart of standard Lithuanian uo and ie are pronounced. The word for 'bread' in standard Lithuanian is duona, the du- part pronounced a little like the English word do and the -on-part pronounced a little like the English word one and the final -a pronounced something like the English exclamation ah. If you can say something like do one ah, but putting the accent or stress on the word do you can come close to the correct Lithuanian pronunciation. The Lithuanian word for 'milk' is pienas. Pronounce the pi- part like English pea, the -en- part like the en in the English word enter, the -as part like the English exclamation ah and then add an -s, so you get pea-en-ah-s with the accent or stress on the word pea. There are, of course, many other characteristics of the dialects. Salys (1933, 22; 1946, 9) held to Jaunius' view that one could separate the Samogitian from the High Lithuanian dialects by the fate of the sequences *tja and *dja. (Remember that the j is pronounced like the English y.) Reconstructed forms such as the nominative plurals *jautjai 'oxen, bulls' and *medjai 'trees' are spelled jaučiai and medžiai (although pronounced /jaučei/ and medžei/) respectively in standard Lithuanian. This is easy to understand because in English the old sequence t-y and d-y are usually pronounced like English ch (=Lithuanian č) or English j :as in jet, i.e., Lithuanian dž). Thus we really pronounce don't you something like doncha and did you something like didja, didzha. The change of *tj and *dj to č and dž is exactly like the English change of ty to ch and dy to j. In the Samogitian dialects, however, this change did not take place, so corresponding to High Lithuanian jáučiai and mẽdžiai we have Samogitian jáutê. and mèdê. where the t and d have been retained. (See Zinkevičius, W8a, 19.) Girdenis and Zinkevičius, however, find the pronunciation of the vowels more important than the pronunciation of the consonants for the establishment of Lithuanian dialect boundaries. (Zinkevičius, 1978a, 19.) As noted before in standard Lithuanian the contrast between the words áukštas 'high, tall' and aũkštas 'floor, storey' is better described as a difference in the position of the stress, i.e., on the á- in the first word and on the -ũ- in the second word. The Samogitian accentual picture is too complicated for easy description. In addition to the major dialects of High Lithuanian and Samogitian which were each divided up into three subdialects according to the names of the directions, these subdialects in turn may be divided up into smaller entities according to other characteristic features. These smaller subdialects are given the names of major cities in the ' regions where they are spoken. In eastern High Lithuanian we distinguish six subdialects, named after the cities: 1. Širvintos, 2. Panevėžys, 3. Anykščiai, 4. Kupiškis, 5. Utena, 6. Vilnius. The first three dialects above are characterized by the fact that they shorten the long vowels of unstressed syllables, whereas the last three don't. In the Uteniškiai dialect an unstressed ė or ie of standard Lithuanian have been merged into e. (i.e., a half-long vowel resembling the a of English at). Thus for standard Lithuanian tėvẽlis (diminutive of tėvas 'father') and pienẽlis (diminutive of píenas 'milk') we encounter the dialect form te.vẻ.li.s and pe.nẻ.li.s respectively. In the Vilniškiai dialect on the other hand the vowel ie of pienẽlis is retained as such, but the dialect is characterized by the same sort of Dzūkish pronunciation described before. The Telšiškiai (named for Telšiai) dialect of Northern Samogitian is characterized by an alternation in the root vowel depending upon whether the final vowel is open or not. Thus we encounter the nominative singular form pùskubilis 'small vat, tub' vs. the genitive singular pòskobẽle (for standard Lithuanian pùskubilio). In the Kretingiškiai (named for Kretinga) dialect this alternation does not take place and we encounter the nominative singular po.skobẽlis with the same prefix and root vowels as in the genitive singular po.skobẽle. Now it is not only phonetic features or the manner of pronunciation which differentiate dialects, but also morphological features. By morphology we mean the roots, the suffixes and endings, of the words, chiefly adjectives, nouns and verbs as far as Lithuanian is concerned. We have mentioned above the various noun case endings which Lithuanian has in common with Latin, Greek, Sanskrit etc. But in the dialects these case endings are sometimes used in different ways from the way they are in the standard language. For example, in standard Lithuanian one says: gyvenu Klaipėdoje 'I live in Klaipėda.' In this sentence one finds the correct use of the locative, i.e. in the form Klaipėdoje the -oje is a locative case ending which denotes 'in Klaipėda.' Now in standard Lithuanian if you wanted to say 'I am going to Klaipėda' you would say važiuoju į Klaipėd-ą and use the preposition į which means 'in' or 'to' with the accusative ending -ą on the end of the noun. But in the Klaipėda region itself, around the mouth of the Nemunas river (which the Germans call Memel and the Russians Neman) one can hear gyvenu į Klaipėd-ą. The use of the preposition with the accusative case is apparently under the influence of German and from the point of view of standard Lithuanian such a usage must be considered incorrect. (Zinkevičius, 1978a, 33.) Apparently under the influence of English, some American Lithuanians make the same mistake. Now in old Lithuanian (and we shall see in some contemporary dialects but not in the standard language) there are some additional cases which probably developed under the influence; of the Finnic languages spoken in the area. These cases have the following names and meanings: 1. an illative or directive case (vidaus einamasis vietininkas) which denotes motion to or in the direction of some place, 2. an adessive case (pašalio esamasis vietininkas) which denotes the place where, or in the vicinity of which something is, 3. an allative case (pašalio einamasis vietininkas) which denotes a motion to the vicinity of some place. three poods of rye at the man's place I bought. legs like at a horse's. Thus it is evident from the preceding that Lithuanian, like all other languages of the world, has different dialects. It is for this reason, perhaps, that sometimes a word or form which is acceptable to one Lithuanian will seem odd or strange to another one. The matter is explained very naturally if the individuals in question come from different dialect areas.